In Circadian-Rhythm-Sleep-Disorders a considerable shift of the individual circadian rhythm is the concealed, biological reason for patient symptoms. Sleep Check allows the assessment of circadian rhythm by determining the individual Dim-Light Melatonin Onset (DLMO). The analytical determination of the DLMO is based on a partial, 5 point salivary melatonin profile. The client is provided with a collection pack containing five saliva collection devices together with the appropriate instructions enabling the client to collect the samples at home. The samples are collected at hourly intervals around the normal sleep time, over the course of one evening. The samples will be sent to the specified in-vitro diagnostic routine laboratory where melatonin concentrations are determined and the individual DLMO is determined. The Sleep Check Collection Pack can be supplied directly by a Medical Health Specialist (sleep specialist, neurologist etc.) during a face-to-face consultation or could be requested directly by the client via internet facilities. The client could also retrieve results directly from the internet for discussion with the sleep specialist depending on the Sleep Center offering the service. Collected samples can be sent to the indicated laboratory where the samples will be analysed either with the highly sensitive Direct Saliva Melatonin radioimmunoassay or the Direct Saliva Melatonin ELISA both supplied by BÜHLMANN. The laboratory results will be plotted on a time curve with a point to point fit. 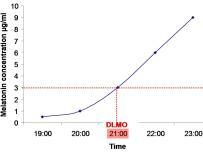 The DLMO is defined as the point where the salivary melatonin exceeds as specific melatonin concentration. By complying the prescribed collection times and procedure the partial 5 point profile allows in most cases to define the individual DLMO. In rare cases the assessment of a 24 hour profilewill be necessary. A significant shift indicates either a Delayed or Advanced Sleep Phase Syndrome, which can be treated either by the correctly timed intake of melatonin or exposure to bright light. Numerous studies have clearly shown the direct correlation between melatonin and circadian rhythm and its involvement in Circadian Rhythm Sleep Disorders. Salivary melatonin concentration directly reflects the physiological melatonin onset in the evening produced by the pineal gland. The Sleep Check concept has been successfully used for many years at the Gelderse Valley Hospital in Ede, Nederland for the assessment of thousands of patients suffering from sleep disorders. A first evaluation of the clients survey after treatment shows that individual adaptation of treatment gives a great client satisfaction rate. 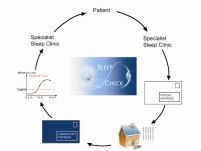 The sleep clinic in Zurzach/Luzern, Switzerland, started with the Sleep Check concept for the assesment of DLMO.